洛克人系列第2部威利博士再臨！洛克人的戰鬥再次揭開序幕。神祕的天才科學家威利博士征服世界的野心被阻止，世界重返和平。不過威利博士重新打造出了８個強敵，再次對「洛克人」發出挑戰！究竟洛克人有沒有辦法跨越這個重大危機呢！？＜請注意＞-------------------------------------------------------------------------------・本作品將原遊戲內容調整為更適合於手機上遊玩，　所以會和原家用主機版的內容有部分差異。・在購買前，請確認是否為下列所記載之適用機種。-------------------------------------------------------------------------------◆新要素「E罐」登場！！使用E罐能夠回復洛克人的體力！去取得散落在關卡中的E罐吧！！鎮守關卡的頭目由６個增加至８個。由８個可選關卡及６個威利關卡構成共計１４個關卡。◆攻略提示只要打倒特定的頭目「灼熱人」「空氣人」「閃光人」萊特博士就會送來輔助機械！！輔助機械共有３種，能製造出可站立的空間。◆遊戲模式本作品準備了２種難度的模式。・NORMAL模式殘機數無限每當死亡時便會顯示接關確認畫面。選擇接關的話，便會在該挑戰關卡中最近的保存點重新開始。・HARD模式比NORMAL模式更為困難的模式。殘機數有限，敵人攻擊增加，關卡中的保存點數量也會減少。◆OPTION設定在遊戲中，可以變更以下的設定。・SOUND數字越大則音量越大・VIBRATION設為ON時，受到傷害會震動。預設為「ON」※未具備震動功能的裝置，不會顯示VIBRATION這個項目。・ATTACKAUTO：開啟時，會自動連續發射洛克飛彈。MANUAL：按下時會發射洛克飛彈。要連續發射的話，需要每次都按下。預設為「AUTO」。・SPEED可調整遊戲的速度。可選擇NORMAL/HIGH。・KEY　CONFIG變更遊戲中的「攻擊」與「跳躍」按鍵的位置。◆運作環境OS4.0～6.0RAM1GB以上本程式非適用OS、非適用機種亦能夠購買。另外即便是高於運作環境以上的機種亦有可能無法運作，敝公司無法保證肯定能正常運作及退款。敬請見諒。MegaMan Part 2Dr. Wiley Second Coming! Mega Man fights kick offagain.Dr. Wiley mysterious genius scientist ambition to conquer theworld is blocked, return to world peace.But Dr. Wiley to re-createthe eight enemies, once again, "Mega Man"Issued a challenge! WhatMega Man Is there a way across this great crisis it! ?-------------------------------------------------------------------------------· This work is adjusted to theoriginal game content more suitable for play on mobile phones,Andit will be the original home console version of the content, somedifferences.• Before buying, make sure to apply the modelsdescribed below.-------------------------------------------------------------------------------◆ new elements"E can" debut! !Use Etank can recuperate Mega Man!Go get scattered in the level of Etank it! !Guarding checkpoints leader increased from6-8.Constituting a total of 14 points from the eight points and sixoptional Willy levels.◆ Raiders TipsDown with specific long as theleader of "burning man" "air people" "flash people."Dr. Wright willbring an auxiliary machinery! !There are three kinds of auxiliarymachinery, can produce standing space.◆ game modesThis work is toprepare two kinds of difficulty modes.· NORMAL modeResidualsmachine unlimitedWhenever death will take off confirmation screenis displayed.Select then off, then, the challenge will be in thelevelRecent save point to start again.· HARD modeMore difficultthan NORMAL mode mode.Residuals machine is limited, increase theenemy attack,Save the number of points in the level will bereduced.◆ OPTION settingIn the game, you can change the followingsettings.· SOUNDThe larger the number the greater the volume·VIBRATIONWhen set to ON, hurt vibrates.Default is "ON"※ vibrationfunction of the device is not in place, will not display VIBRATIONthis project.· ATTACKAUTO: When turned on, will automatically andcontinuously Locke missile launch.MANUAL: Locke will launchmissiles when pressed.To continuously transmitted, the need topress every time.Default to "AUTO. "· SPEEDAdjust the speed of thegame.Alternatively NORMAL / HIGH.· KEY CONFIGChange the game"attack" position "jump" button.◆ operating environmentOS4.0 ~6.0RAM1GB moreThis program is suitable for non-OS, a non-applicablemodels also can buy.In addition, even higher than the aboveoperating environment models also may not work,Brastel certainlycan not guarantee proper functioning and a refund.Please forgiveme. A new warrior has entered the ring! Take control of 32 worldwarriors and test your mettle against players from around theworld. Street Fighter IV: Champion Edition perfects the winninggameplay formula by offering the most exciting fighting game onmobile. Long time Street Fighter fans can jump into the action andhave an instant familiarity with the controls. For more casualplayers Street Fighter IV features numerous settings and tutorialsthat put you on the path to victory. - Download for free and unlockthe complete game for one low price. Free game includes oneplayable character and three AI characters. - Fight as 32 StreetFighter characters including fan favorite and Android exclusive,Dan. - Intuitive virtual pad controls allow players to execute fullmove sets including Unique Attacks, Special Moves, Focus Attacks,Super Combos and Ultra Combos - Take your game to the next levelwith a Bluetooth controller (Controllers do not work in menus, theyfully function in multiplayer and single-player gameplay.) - Battlehead-to-head against players from around the world via Wifi -Single player “arcade” and multiplayer modes. - Unleash super moveswith a tap of the “SP” button. - Four levels of difficulty. The Fifth Chapter in the Mega Man SagaWith Dr. Wily's plans foiledonce more, Mega Man has settled back into a peaceful life. Butnothing could have prepared him for the apparent betrayal by hisown brother, Proto Man... Proto Man appears at the head of a legionof maniacal robot masters, the worst threat to world peaceyet!PleaseNote:-------------------------------------------------------------------------------・The gameplay and difficulty have been optimized for smartphones sothat certain elements will differ from the original game.・Confirmthat your device meets the minimumspecs-------------------------------------------------------------------------------NEW FEATURESThe reformed Dr. Cossack has developed a new supportdroid to aid Mega Man; "Beat"! Collect the special plates scatteredthroughout the eight starting stages to unlock your flying friend.Once unlocked, Beat can be called in to dive-attack enemies!SLIDINGCONTROLSHold down + jump while playing to slide. Use this techniqueto move quickly, dodge attacks, and fit through narrowspaces!MODESThis version features a choice of two difficultymodes.・Normal Mode - (Unlimited continues) The continue screen isdisplayed whenever Mega Man dies. Selecting Continue allows you torestart from the last checkpoint you passed in the currentstage.・Hard Mode - This challenging mode limits your number ofcontinues, and enemy attacks deal more damage. There are also fewercheckpoints within stages.OPTIONS (The following settings can beadjusted in-game. )・Sound - Increase the number to raise thevolume.・Vibration - Set to "On" to have your device vibrate whenMega Man takes damage. (Default setting: On) Note: This option willnot be displayed on devices with no vibration function.・Attack -Auto: Hold the attack button for rapid-fire Mega Buster shots.Manual: Each press of the attack button fires one Mega Buster shot.Tap repeatedly for rapid-fire shots. (Default setting: Auto)・Speed -Choose between Normal and High to adjust gameplay speed.・Key Config- Change position of the in-game attack button and jumpbutton.DEVICE SUPPORTThough this app can be purchased on devicesthat have not been confirmed to be compatible, we cannot guaranteethat it will function correctly on such devices. Capcom accepts noresponsibility for problems caused by using incompatible operatingsystems and devices and does not offer refunds. We appreciate yourunderstanding.RECOMMENDED SPECSSmartphone or tablet with Android4-6, RAM 1 GB or moreIt may be possible to download the game on adevice that is not officially supported. Play a piece of gaming history with the original Mega Man, theaction-packed classic platformer!In the year 200X, six robotscreated by master roboticist Dr. Light are tampered with by theevil genius Dr. Wily, and go on a destructive rampage! Only onerobot remains who can put a stop to Wily’s plans and restore worldpeace: the heroic Mega Man.PleaseNote:-------------------------------------------------------------------------------・The gameplay and difficulty have been optimized for smartphones sothat certain elements will differ from the original game.・Confirmthat your device meets the minimumspecs-------------------------------------------------------------------------------WHAT IS MEGA MANThe original Mega Man captivated users at the timeof its release with its challenging gameplay and innovative conceptof taking the weapons from your enemies, then using them to exploitweaknesses in the bad guys yet to come.MODESThis version features achoice of two difficulty modes.・Normal Mode - (Unlimited continues)The continue screen is displayed whenever Mega Man dies. SelectingContinue allows you to restart from the last checkpoint you passedin the current stage.・Hard Mode - This challenging mode limits yournumber of continues, and enemy attacks deal more damage. There arealso fewer checkpoints within stages.OPTIONS (The followingsettings can be adjusted in-game. )・Sound - Increase the number toraise the volume.・Vibration - Set to "On" to have your devicevibrate when Mega Man takes damage. (Default setting: On) Note:This option will not be displayed on devices with no vibrationfunction.・Attack - Auto: Hold the attack button for rapid-fire MegaBuster shots. Manual: Each press of the attack button fires oneMega Buster shot. Tap repeatedly for rapid-fire shots. (Defaultsetting: Auto)・Speed - Choose between Normal and High to adjustgameplay speed.・Key Config - Change position of the in-game attackbutton and jump button.GAMEPLAY TIPSSearch Elec Man’s stage for theMagnet Beam, which lets you place platforms wherever you like! Toaccess the Magnet Beam, you’ll need to defeat Guts Man and get hisweapon, or defeat Elec Man and play through the stage again withhis weapon.DEVICE SUPPORTThough this app can be purchased ondevices that have not been confirmed to be compatible, we cannotguarantee that it will function correctly on such devices. Capcomaccepts no responsibility for problems caused by using incompatibleoperating systems and devices and does not offer refunds. Weappreciate your understanding.RECOMMENDED SPECSSmartphone or tabletwith Android 4-6, RAM 1 GB or moreIt may be possible to downloadthe game on a device that is not officially supported. The game was released in Japan in 1988 and in North America and PALregions the following years. Mega Man 2 continues the titularprotagonist's battle against the evil Dr. Wily and his roguerobots. The game features graphical and gameplay changes from thefirst Mega Man game, many of which have remained throughout theseries.Although sales for Mega Man were unimpressive. 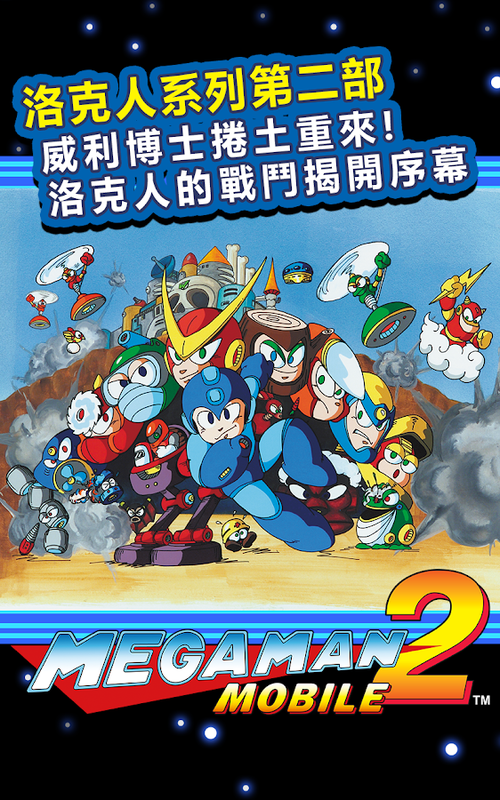 Unusedcontent from the previous title was integrated into Mega Man 2.Takashi Tateishi composed the soundtrack, with Yoshihiro Sakaguchiserving as a sound programmer.With more than 1.5 million copiessold, the game is the best-selling Mega Man title. Critics praisedits audio, visuals and gameplay as an improvement over the firstgame. Many publications rank Mega Man 2 as the best title in theseries, and as one of the greatest video games of all time. Thegame has been re-released on several consoles and mobile phones.